Posted by Unknown / On : 1:00 AM/ Thank you for visiting my small blog here. If you wanted to discuss or have the question around this article, please contact me e-mail at Gps_86@gmail.com. 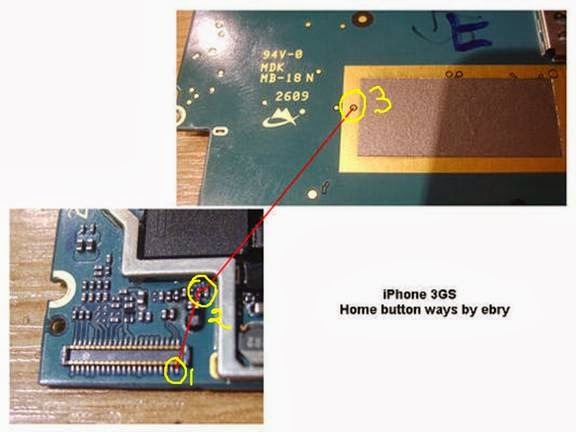 IPhone mobile have just one button on front side that is home button. Sometime home button doesn’t work in this case we can’t start menu or any program in iPhone. Even we can’t unlock iPhone because home button is main key for all programs. 3. After all if still no solutions then finally connect three points together using applying jumper from flex connector point 1 to keypad filter and then from filter keypad point on pcb as shown in image below. During this point connection we should connect all points properly using special iron because bad soldering process my result in bad result.